Some materials such as crushed concrete have been recycled for many years, but they have generally featured in low-grade applications, such as fill and site access roads. Although there are substantial economic, as well as environmental, benefits to be gained from increasing utilisation of reclaimed and recycled materials, attempts to bring them into higher-grade usage have been hampered by lack of knowledge and information on sourcing, specifying and applications. This handbook addresses this problem by consolidating available knowledge into one user-friendly reference. The opening chapters increase awareness of the opportunities for using reclaimed and recycled materials and look at ways of overcoming the barriers that designers and specifiers may face when considering them. 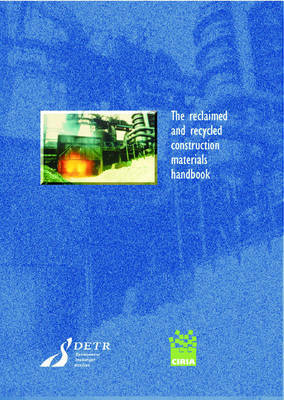 The book includes guidance on current waste management legislation, assessment of risk, economic issues, specifications and standards, and the implications for designers.It summarizes the opportunities for using these materials in different areas of construction and give comprehensive details on properties and performance, sources and availability, current applications, specifications, advantages and constraints, and potential future uses. Numerous case studies provide recent examples of successful applications of the materials and techniques discussed. Written in straightforward language and designed for ease of use, the handbook offers authoritative guidance for designers, specifiers and clients. It should also provide an important boost for all concerned with improving the construction industry's environmental record.